In 2013, EHG opened an alluring hotel on the edge of Hoi An old town. Wowing our guests and exceeding every expectation (even our own), we were energized to push the boundaries and offer something more special. Taking the plunge, we seized on a fortuitous opportunity to develop the land behind the hotel. Working with inspiring designers and planners, our vision of including an environment reflecting Hoi An old town became a reality. The east wing boasts a terrace of town house villas featuring striking period-style suites, a fine-dining venue opening onto a sparkling blue saltwater pool, the first in the Hoi An old town area. 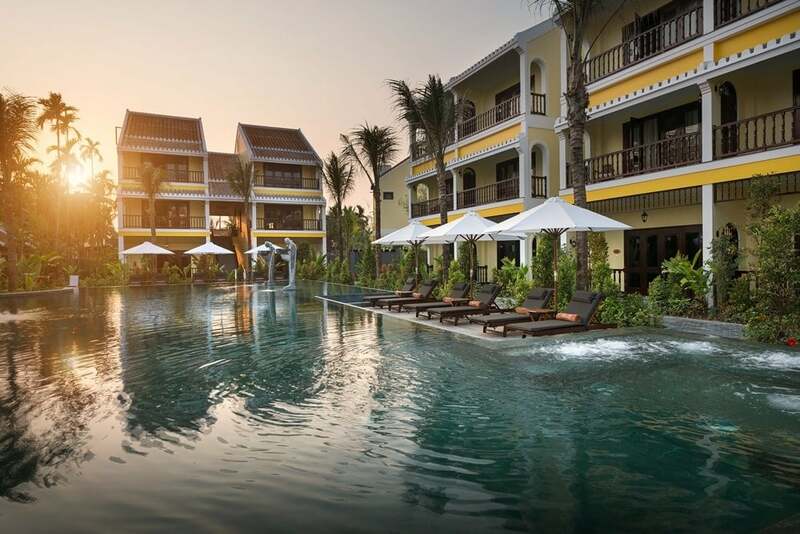 Thus, the face of what was originally Essence Hoi An Hotel & Spa was transformed into the La Siesta Resort & Spa. Boasting superior services and facilities, the property joined the ranks of our La Siesta brand which encompasses a wider and more luxurious hospitality offering. Stepping into one of the east wing suites is like stepping into Hoi An’s history combined with modern touches. The hallways are painted in the vibrant traditional color yellow, representing prosperity and Hoi An old town’s signature hue. Photos of the town’s heritage decorate the airy hallways, and twinkling candelabra enhance the feeling of stepping back in time. Room styles include the Junior Suite (with balcony), Veranda Suite (with a pool view), Premium Terrace Suite, Junior Suite Villa (with a pool view), Duplex Suite (with balcony) and Duplex Villa Suite (with balcony). Each type of room includes a roomy king size bed, exquisitely varnished hardwood floors, and is accented with forest green, cream and deep brown wood. Some suites feature four poster beds, while white claw-foot bath tubs and marble showers add to the feeling of simple luxury. Rattan screens separate the open spaces into sections. The unique architecture and design of enchanting Hoi An old town are the inspiration behind the east wing. In 1999 Hoi An (meaning “peaceful meeting place”) with its melting pot of cultures and a history dating back to the 15th century, was rightfully honored as a UNESCO World Heritage site. The setting, blessed with an incredible heritage of around 1,000 ancient buildings, retains its original character and atmosphere. Hoi An is also famed for a centuries-old ritual of decorating the town with a myriad of lanterns that light up the night sky. Local tradition is in evidence throughout the east wing, while high-end services and amenities make for the very best of a modern five star environment with ultra-comfort. A personal butler service, exclusive toiletries from La Siesta’s own line of spa products and state of the art in-room technology, such as Samsung sound-bars and espresso coffee makers, are the icing on the cake. Other highlights include a luxurious spa lounge and the Temple restaurant, serving fine dining, European-influenced cuisine in an attractive poolside setting. The east wing blends seamlessly with the property’s original west wing, acclaimed by guests for its charming colonial-style and some of the best Vietnamese cuisine at Red Bean restaurant.